Zipp's QuickView TT Mount provides an "out front" style mount for Garmin Edge Computers specifically catering to time trial and triathlon aerobars. Mounting directly to the extensions of aerobars using a strurdy T25 stainless steel bolt, the Quickview TT Mount is lightweight, while remaining durable. The 1/4 twist mount holds Garmin Edge Computers firmly in place, and in an easy to see and access place right in front of your cockpit. This mount is shaped for ideal aerodynamics when mounted on the left, but will work just fine on either side, it should be mounted before any handlebar tape as well. 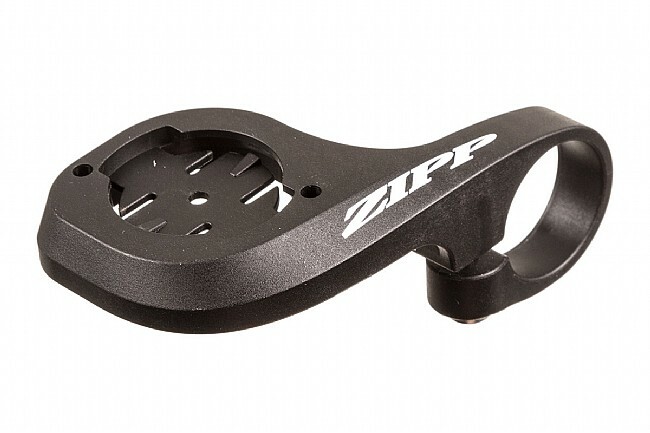 The Zipp QuickView TT Mount For Garmin Edge Computers is compatible with Edge 200, 500, 510, 800 and 810 models. Fits 22.2mm handlebars. 18 grams (claimed). Available in Black. needed a mounting bracket for my Garmin 500. Voila, this Zipp bracket did the trick. installed in literally seconds. This puts my Edge 800 right in my field of vision for TTs and Tris. Secrure and light. Takes up almost no space and doesn't get in the way of movements or hand positions. Very useful. Very well made. Does not fit thinker handle bars and was not compatible with my Garmin. Only two notches makes the screen only mount sideways.